ENDOCEM MTA is a revolutionary next generation MTA product based on the science of pozzolan reactions. featuring quick setting times, easy handling with consistent outcomes, excellent sealing capabilities and outstanding biocompatibility. ENDOCEM MTA exhibits high efficacy not only in apical retro-filling and root perforations but also in vital pulp therapies such as direct pulp capping. ENDOCEM MTA is non-miscible with liquid components, including blood, and thus is ideal for use in clinical situations where bleeding is difficult to control. It has a fast setting time that allows for resin bonding to occur immediately after setting. When used while pulpal bleeding occurs, a thin layer is applied first, and bleeding is controlled with cotton pellet. The remaining ENDOCEM MTA may then be applied. Setting may be confirmed by spraying water vigorously with an air/water syringe. Incomplete setting is identified when water spray washes away part of the material placed. If this is found to be the case the restoration should be removed in its entirety with the process started anew. ENDOCEM MTA maintains its integrity in less than ideal clinical situations, including contamination with blood or saliva and presence of inflammation or infection. It is compatible with any type of bonding agents. Please see test results above. ENDOCEM MTA is seen as reaching a lower level of strength than ProRoot MTA initially. However, the bond strength increases over time. Unlike conventional MTAs that exhibit bonding strength changes dependent on external factors such as saliva, blood, or inflammation, ENDOCEM MTA exhibits a consistent level of bond strength regardless of external factors. ENDOCEM MTA exhibits consistent shear bond strength across all bonding agent types. This is further proof that ENDOCEM MTA is compatible with all bonding agents, and not adversely affected by specific characteristics of certain bonding agents. This is an example of stable clinical outcomes in presence of severe inflammation with minimization of dead space resulting from pozzolan reaction. After MTA was mixed in accordance with manufacturer’s guidelines, it was applied in a 5 mm X 2 mm Teflon tube, and then immediately immersed in FBS. After 24 hours it was taken out, washed, and observed under SEM. When (b) Proroot MTA is used for the same protocol the FBS infiltrated part was found to have been washed away during the setting process. When (c) IRM is used for the same protocol resistance to wash-out is comparable to that of (a) ENDOCEM MTA. However, many adjacent gaps are observed, and this is indicative of weaknesses where liquids, including water or blood, could possibly invade. When exposed to liquids, i.e. saliva or GCF, the seal may be compromised over time due to degradation. Therefore, adding a resin base will be necessary before final restoration in direct pulp capping. 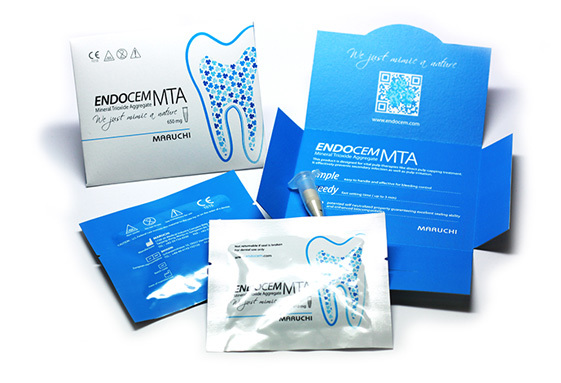 ENDOCEM MTA allows teeth to maintain natural esthetics as it does not cause discoloration. Picture view after tooth was filled with MTA and restored in artificial saliva. 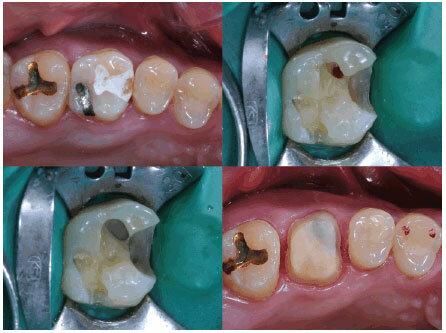 Unlike (b) Proroot MTA or (c) Angelus MTA, (a) ENDOCEM MTA does not cause discoloration of adjacent tooth. This is possible through the pozzolan reaction’s blockage of dentinal tubules. However, it should be noted that if leakage occurs in the final restoration, ENDOCEM MTA itself could undergo corrosion and that process may lead to discoloration. ENDOCEM MTA has antimicrobial effects, not only on S. Mutans but also on E. Faecalis. Enterococcus Faecalis is a pathogenic bacterium found with highest frequency in roots of endodontic failures, and is resistant against most MTA. ENDOCEM MTA possesses strong anti-bacterial properties against E.Faecalis. Our patented manufacturing techniques guarantee ENDOCEM MTA’s excellent biocompatibility. Surgical method was selected over prosthetic approach due to post positioning. A distinct linear alba may be observed after surgery using ENDOCEM MTA. Due to the length of the post, surgical approach was best in this case. The restoration was poorly placed resulting in the tooth experiencing excessive occlusal interference. 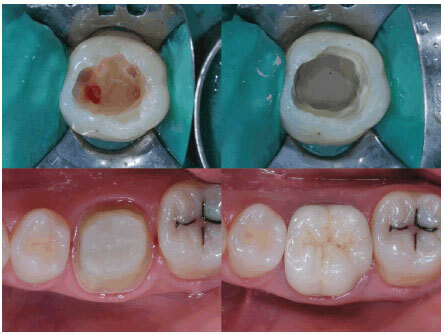 Nevertheless, the tooth is seen in the process of healing after surgery and placement of ENDOCEM MTA. 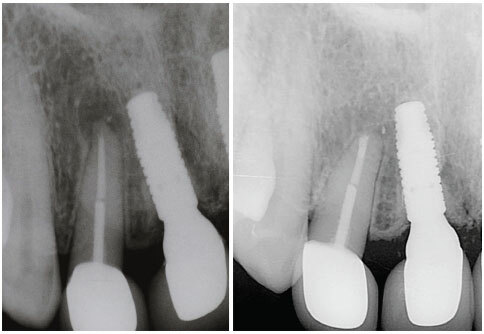 Extraction was necessary due to extensive root contamination and apical lesion. Retro-filling was completed using ENDOCEM MTA and replantation was performed. 11 months post-operatively, good healing with development of new hard tissues found on radiograph. ENDOCEM MTA particles are smaller in size on average than conventional MTA products, and it also has a high viscosity. Therefore, it is easily applied using an appliance such as the CENTRIX gun. Another important feature is ENDOCEM MTA’s non-miscibility that allows it to maintain integrity in less than ideal clinic conditions such as uncontrolled bleeding, without fear of wash-out. The unique characteristics of ENDOCEM MTA facilitate its use in areas that may be difficult to isolate and maintain a dry field. Strip perforations may be successfully restored with ENDOCEM MTA. Please see above. Case of pulpal inflammation due to Dens Evaginatus and fracture. After canal irrigation was performed up to the necrotized area, the canal was filled with ENDOCEM MTA by retro-filling method. After case completion the treated area looks almost indistinguishable from natural root. Many studies have found that success rates of direct pulp capping is significantly affected by the cause of pulp exposure, scope of pulp exposure, and patient’s age. However, ENDOCEM MTA boosts rates of successful outcomes to the point that it exceeds that of the conventional endodontic treatment regardless of aforementioned factors in direct pulp capping. When pulp exposures occur in anterior teeth, Partial pulpotomy with MTA is likely the best treatment option. When doing so, EMDOCEM MTA, impervious to contamination by blood, is the safest product choice for successful clinical outcomes. Direct pulp capping and resin core build up on maxillary 1st molar ENDOCEM MTA makes immediate resin bonding and preparation possible after treatment due to its fast setting time. ENDOCEM MTA may be used in primary teeth without total bleeding control, with placement of stainless steel crown immediately after treatment. ENDOCEM is biocompatible; and thus, causes low level of irritation resulting in less calcification. 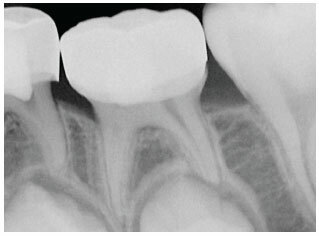 However, clinical findings from pulpotomy treatments show that ENDOCEM MTA also induces calcification in root canals.